Here is some unusual marking on a Swedish spoon. A tablespoon, 8 1/2" (21.5cm) in length, with feather edged border. MALMSTEDT - Gothenburg city mark - P2 date mark (1797) - Three Crowns State Mark. The maker is unknown to me. Hopefully some can assist with this first question? But what about the marks below? They are struck on the front of the spoon. I suppose that they are not silver marks, but marks perhaps, that identify the owner, but the punch used is so detailed that surely these must be government marks. Here you are: Johan Malmstedt 1783-1831 from GÃ¶teborg in Sweden. he was born 1759, apprentice 1.6.1775, journeyman 2.7.1781 and master 19.3.1783, alderman 12.2.1810. He was married to Helena Westman 1783 and he died 7.6.1831. No, the second marks are not silver marks but probably nobility crests due to the coronet (?). Is it Swedish nobility or not you have to find out for your self. There are almost Swedish 3000 crest to scan. Many thanks for your help with the maker. The marks on the front are not struck neatly, not like you would expect to have them struck onto the family silver. I wonder if this spoon was from a government department, perhaps military or naval mess, or consular silver. You're welcome, on second taught your wondering is not bad at all, but the coronet? Unfortunately I'm a Finn not a Swede and unfamiliar with the Swedish military crests. Just moving this one to see if any further information can be found for these armorial marks. May be over simplifying this process but 1797 as a relative date in relation to the spoon. The left coat of arms is mounted cavalry with crossed muzzle loading rifles above. Unit insignia? Infantry are organized into paltoons, companies, etc. Cavarly into squadrons. Could it be that this prince, hence the cornet, was the commanding officer, honorary or not at the time? May help to narrow down the possibilities. Yes, I think we're on the right track. Let's hope someone can come up with additional information. The shield on the right at first appeared to show a chevron between three stars but the last strike appears to show an additional smaller shield below that third star. Can't seem to isolate Swedish armorial crests from primarily English ones. Someone else may have better luck. The spoon illustrated has been struck with a similar device. Has anyone come across such marking before? Or has knowledge of it? Appears to be another good lead. After reading your post Trev, in English titled: The Swedish Cavalry Regiments of the Napoleonic Wars by Bjorn Bergerus. Most of the units recruitment was through the Crown's Allotment System Office. Although there was one unit made up of Nobles referred to as The Flag of Nobles of Sweden and Finland (Adelsfanan i Sverige och Finland). A further search lead me to Tacitus.Nu at https://tacitus.nu/karoliner/fanor/Fanr ... /vol-1.htm Quickly viewing the regimental flags turned up no positive match. Someone who speaks Swedish may have much better luck. Many thanks for the useful link and your further thoughts. It is very much appreciated. Always happy to help when I can. Going through Tacitus.nu more slowly today, it was stated that regimental standards had two different motifs. On the obverse was the provincial coat of arms and the reverse were the Royal cypher. Some the provincial coats of arms do bear a coronet at the top although only one unit shown of volume 5 #248 Drottningens Livregemente 1780 illustrated a double coat of arms similar to the one we seek. Did a general search on Swedish, Finnish, Danish, and Norwegian provincial and municipal coats of arms without a possible match. Still believe the one of the right of yours is personal or provincial and the one on the left very military focused. Bergerus mentions that only the Cuirassier and Carabineer units carried side arms with attachable stocks that could turn them into carbines. Tacitus.nu has a guest book where you can ask the site owner Orjan Martinsson questions. Might be time to ask his and Bjorn Bergerus assistance. Thank you Warren for your continued help in attempting to solve this mystery. 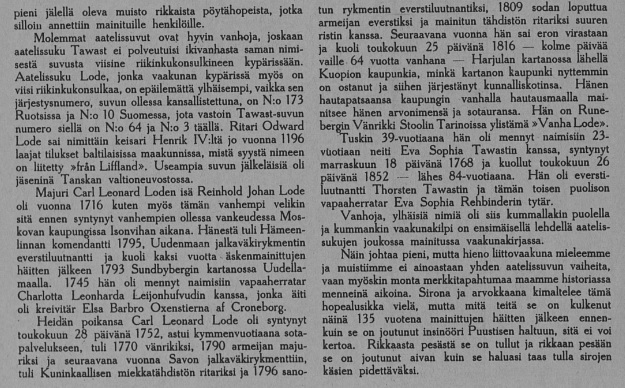 Here's the full article that I found, perhaps a kind Finnish speaker can tell us if there are any clues contained within the text? I don't know if this thread is still active or if the problem has been solved. Google search just bought me here and I noticed the Finnish article so I thought to enlighten you about it's content (I'm from Finland). 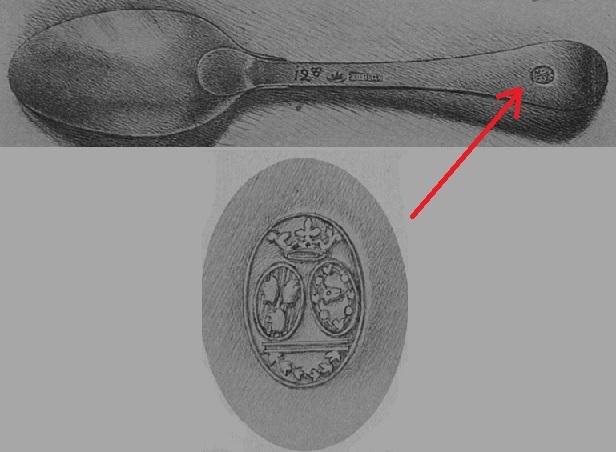 So basically it's about a silver spoon made in Helsinki in 1791 and stamped with alliance coat of arms by major Carl Leonard Lode and Eva Sophia Tawast (both members of the nobility) who were married in 1791 (Finland was then part of Sweden). The spoon has probably been a gift and it has been stamped with a specially made stamp which has the coat of arms of both families and probably the same stap can be found in all of their silverware. Thank you very much for the information, and for the very useful link, it is appreciated. I shall study it with interest. 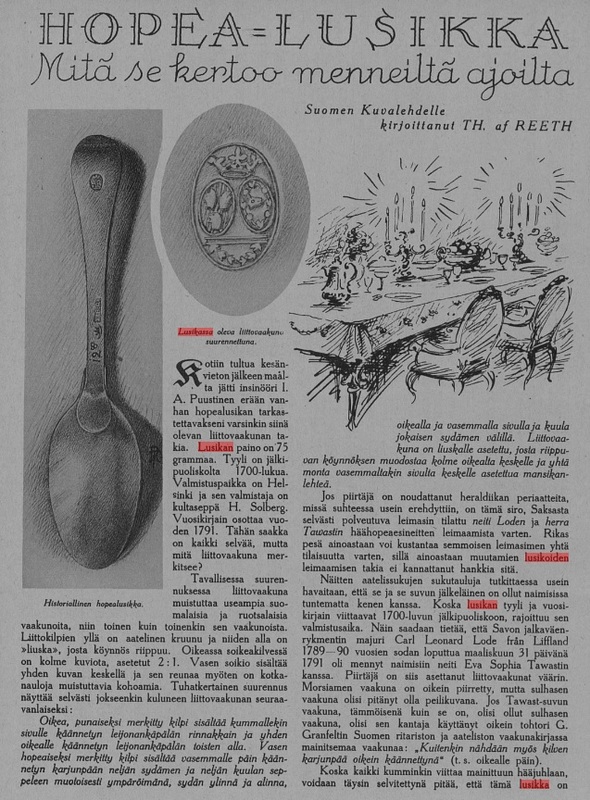 Moreover Casimir Carl Oskar Reuterskiöld married friherrinnan Johanna Charlotta (Jeanette) Stierncrona in 1844 (see TAB 32 of the Reuterskiöld link in the previous post) so this could be the connection between the families and explain the alliance coat of arms in the spoon although the spoon is older than the date of the marriage. Yes thank you Sasropakis those are the exact coats of arms for both families.